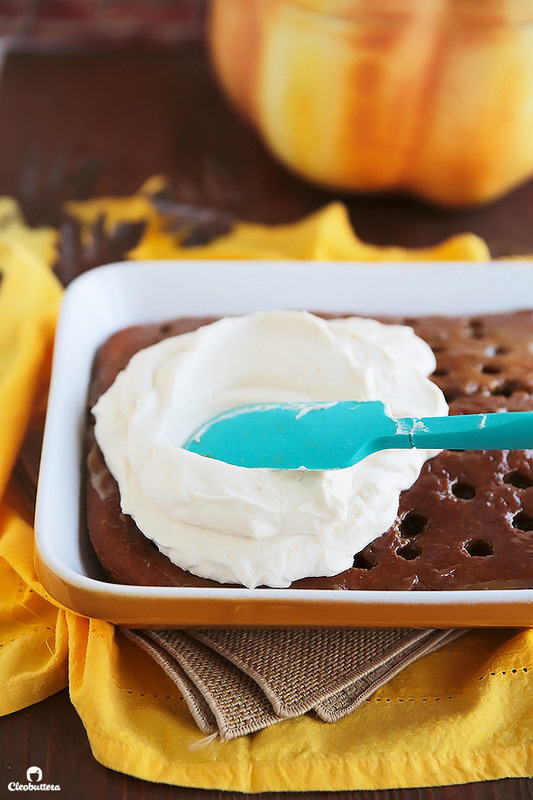 This superbly moist pumpkin spiced cake is so easy to make with the use of a revamped cake-mix. 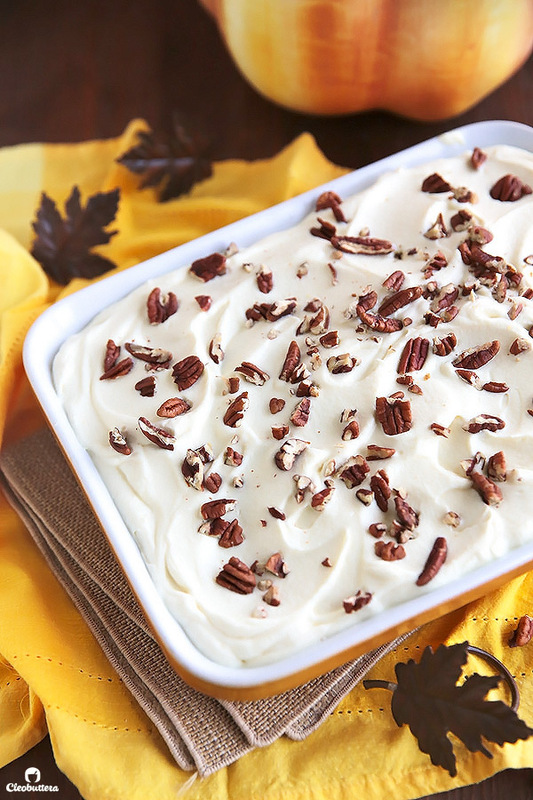 With its pockets of sweetened condensed milk, not-too-sweet caramel sauce, and clouds of caramel whipped cream and pecans, this cake is a sure hit with the crowd! Yet Pinterest, Instagram and pretty much the entire blogging world are telling that I’m far behind fall. Alright you manipulative social media you! I’m listenin’. 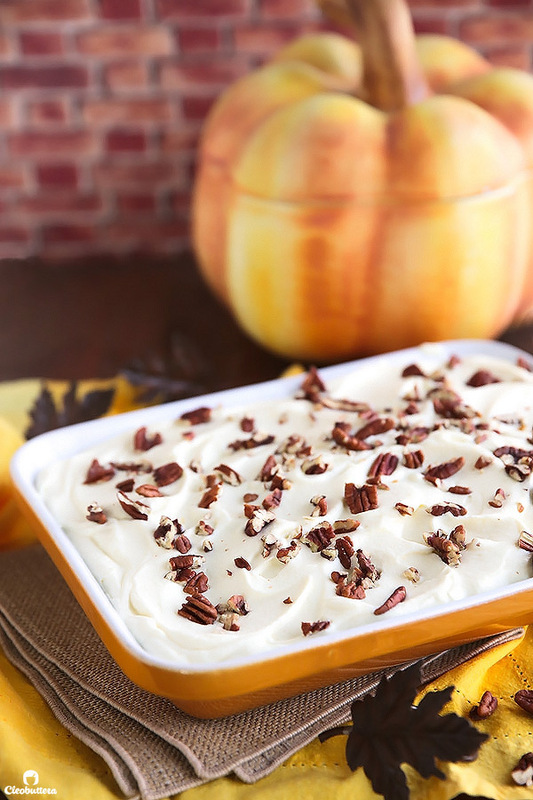 I’m breaking out the iconic fall dessert ingredient…the PUMPKIN! It’s not like there’s such a thing as fall baking in Egypt, but when all you see on the internet is pumpkin this and pumpkin that, you crave pumpkin and then you start dreaming of pumpkin, and that’s when you know that pumpkin something needs to happen in your kitchen asap, even if the weather is telling you otherwise. And this, you guys, is the luscious outcome of a severe pumpkin cravings combined with my love for the ever-popular poke cakes. 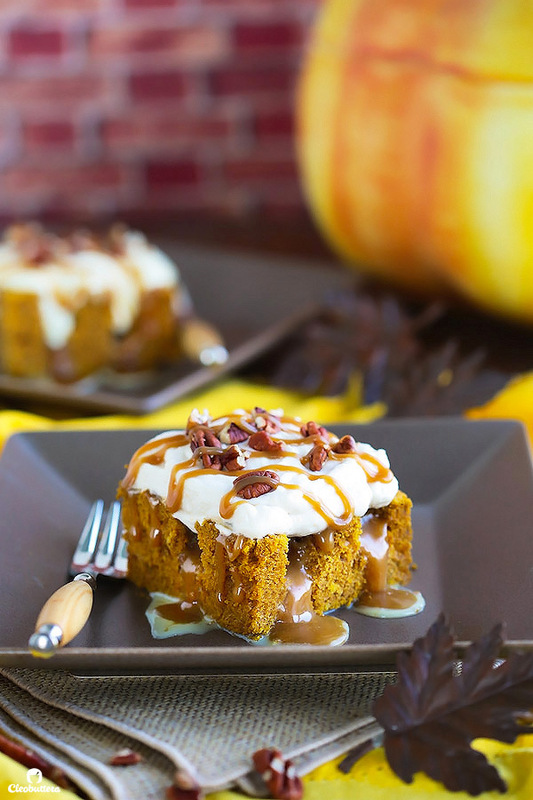 An irresistibly moist and flavorful pumpkin cake that gets poked like there’s no tomorrow, then drizzled with sweetened condensed milk (yum), a not-too-sweet caramel topping (double yum!) and finished off with swoops of caramel whipped cream (dreamy) and chopped toasted pecans (because crunch crunch). I think that by now we’ve established the fact that I love baked goods that ooze more than anything else, see proof here, here, and here, but I’m also a sucker for a play in textures, and this cake has all of it! You get the cake-y, the saucy, the creamy and the crunchy. So it’s all sorts of awesomeness in a bite. The first time I made this cake, which was ironically in mid August (it was for research! ), it got polished off in less than an hour. POLISHED! There wasn’t a crumb left behind. People raved about it for days. So I’d say it was a real winner 😊. You just gotta try it for yourself to see how good it is. The pumpkin cake base starts with a yellow cake mix, which makes it a snap to make. Believe you me, no one will ever be able to tell that it wasn’t made from scratch! 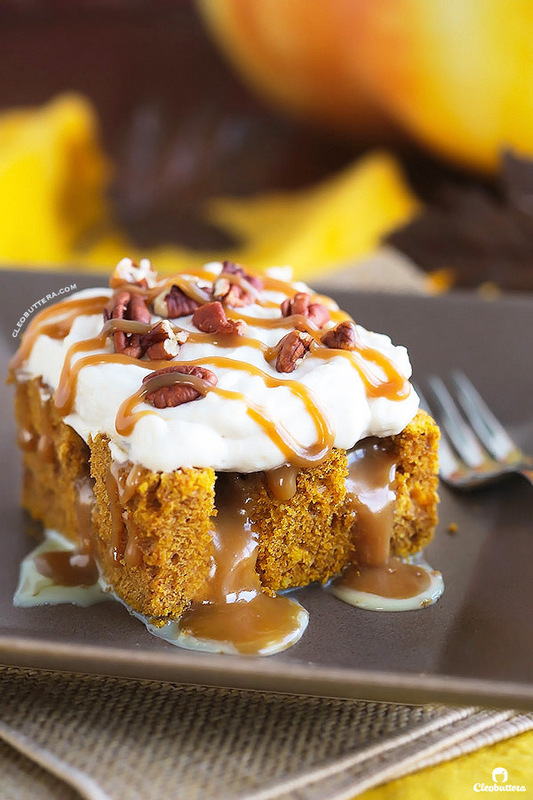 With the generous amount of pumpkin puree that goes into it, along with a hefty dosage of spices, this cake tastes like you’ve spent hours making it. Its so moist, fluffy and flavoful. It is really small on the effort, BIG on the flavor. I have this EPIC pumpkin layer cake that’s made from scratch (and browned butter! ), which is a bit more time consuming than this one. So I’d say that if you ever want to make it but don’t feel like going through all the steps, I urge you to use this doctored cake mix recipe instead and adapt it to fit the layer cake recipe. For this one though, all you need to do is whip up this dump and stir cake batter, pour it in the pan, bake it, let it cool a little, then poke it repeatedly almost 3/4 of the way down, using the handle of a wooden spoon or in my case the rubber spatula. Then you’ll drizzle it with sweetened condensed milk, followed by the caramel topping (which I’ll show you exactly how to make below). I know it’s not much of a looker right now, but worry not my friends, we’ll fix that. I’m in love with this caramel topping. 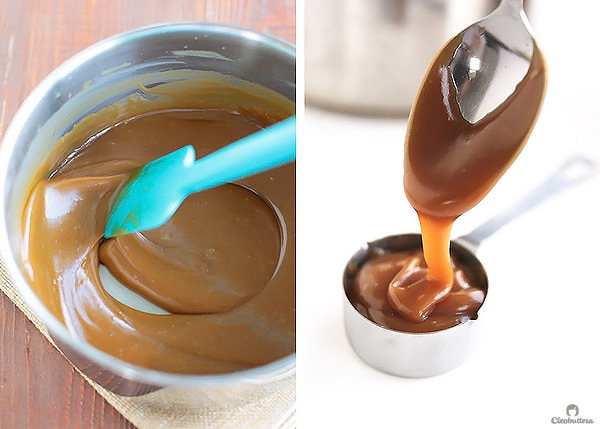 Not only is it so easy to make, but it’s not cloying sweet like most caramel sauces. It kinda reminds me of this amazing icing, but has a more pudding-like texture and is less fussy. So if you’re worried that by adding both sweetened condensed milk and caramel topping will turn the cake into a sugar bomb, don’t be. It’s really surprisingly perfectly sweet. 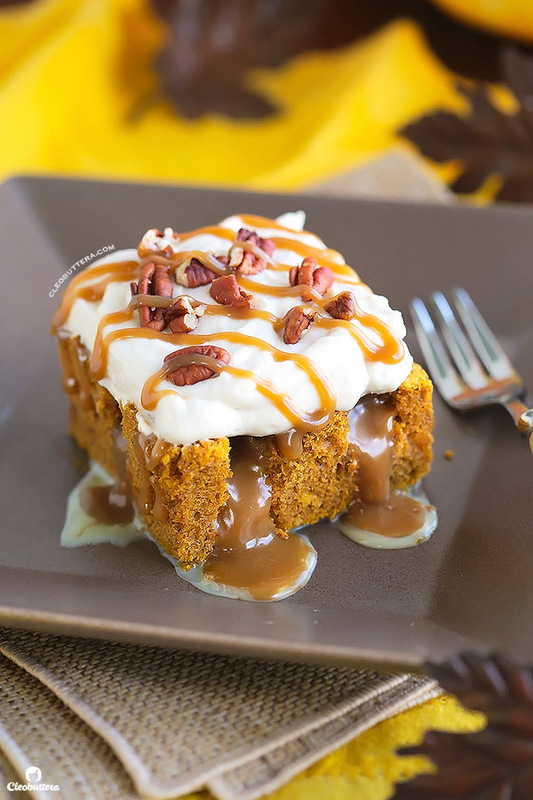 The topping uses twice as much heavy cream as the sugar (which is abnormal for caramel sauces), so you get all the flavor of the caramel and non of the tooth-aching sweetness. 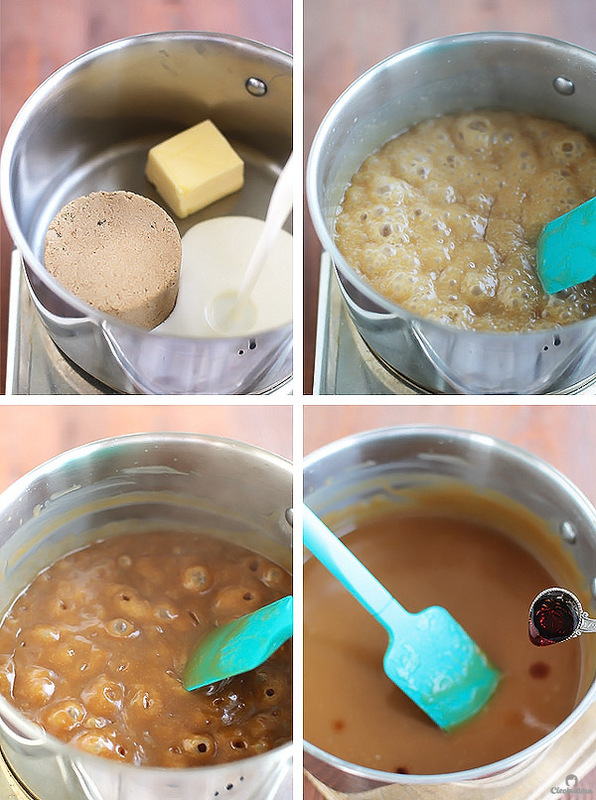 You’ll start by melting together brown sugar, butter and heavy cream in a saucepan. Bring it up to a boil, then reduce the heat to medium and let it simmer for 12 to 15 minutes (set a timer!) What starts out out a watery mess, will then deepen in color and thicken into this glorious, drinkable sauce. A little vanilla goes in at the end and its ready to be used over the cake. Before doing that though, you’ll need to measure out and set aside some caramel that will be used to make the caramel whipped cream and to garnish the finished cake. After the cake has cooled, its time to make the caramel whipped cream. Make sure that the reserved caramel topping has cooled completely before adding it to the whipped cream. It shouldn’t be chilled either; room temperature is perfect. You’ll slightly whip the cream until frothy, the add in the reserved, cooled caramel and whip again until stiff peaks form. Like so. The finished whipped cream should be slightly beige in color, which the photo below is not showing because I’m still an amateur food photographer. In real life it was beige though. 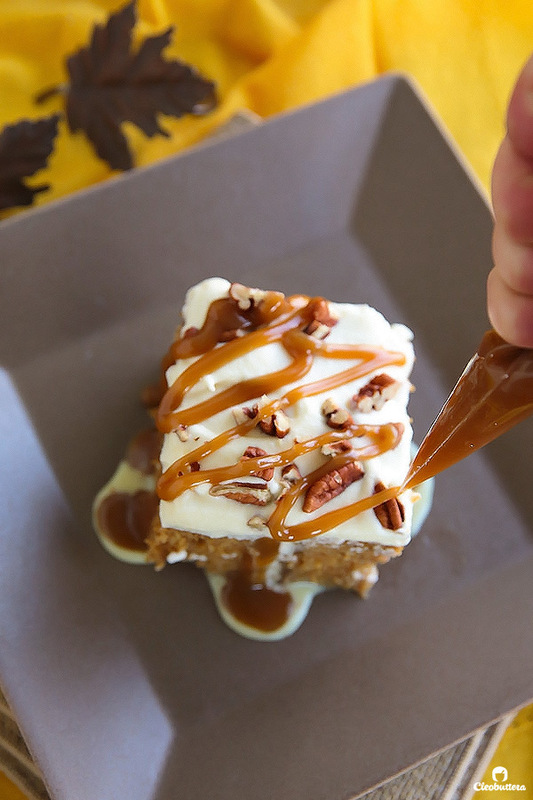 Smother the cooled cake with the pillowy caramel whipped cream swoops. Not so ugly anymore right? Oh and don’t forget to follow me on Instagram; you’ll see a little video of the making of this cake and many others! Adjust oven rack to middle position and preheat oven to 350F/180C. Grease or spray the bottom of a 13x9-inch pan. In a large bowl, beat cake mix, pumpkin puree, water, oil, eggs, pumpkin pie spice and cinnamon with electric mixer on low speed until moistened. Increase speed to medium and mix for 2 minutes, scraping the bowl occasionally, until well combined. 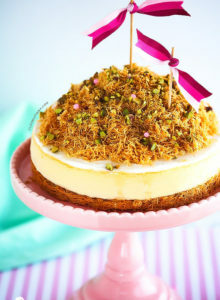 Pour the batter into the prepared pan and bake for 26 to 33 minutes or until a toothpick inserted in center of cake comes out clean or with a few moist crumbs attached. Allow the cake to cool in the pan for 30 minutes. Meanwhile make the caramel topping. In a 2-quart saucepan, heat whipping cream, brown sugar and butter over medium-high heat until boiling. Reduce heat to medium and simmer uncovered for 12 to 15 minutes (set a timer), stirring frequently, until thickened to the consistency of thick caramel sauce and deepens in color. Remove from heat; stir in vanilla. Measure out 1/4 cup plus 2 tablespoons of the caramel and set aside in a small bowl. Measure out another 2 tablespoons of the topping and set aside in another small bowl. Cover both bowls with plastic wrap and allow to cool to room temperature; they will later be used to make the whipped cream and to garnish the cake. Allow the remaining caramel topping in the saucepan to cool slightly, about 5 minutes before pouring over the cake. Poke warm cake every inch, 3/4 of the way down, with the handle of a wooden spoon or the thick end of a chopstick. Slowly pour condensed milk all over cake. Let stand until milk has been absorbed into cake, about 5 minutes. 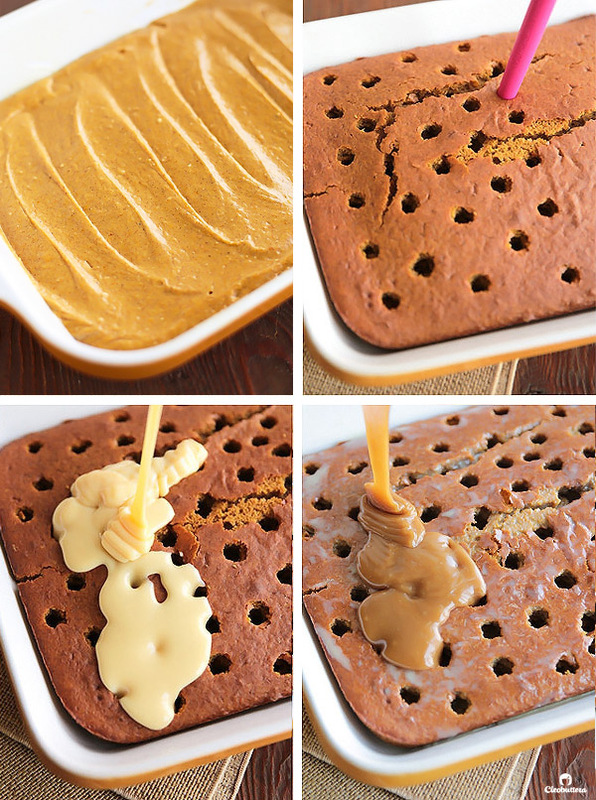 Slowly drizzle the hot caramel topping, pressing slightly with a spatula into holes. Allow the cake to cool completely before topping with the caramel whipped cream. 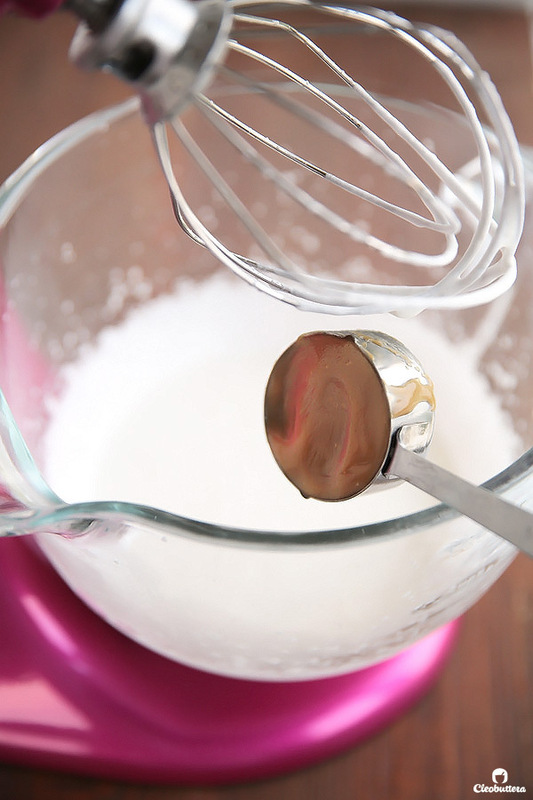 For best whipping results, place the bowl of the electric mixer and the whisk attachment in the freezer for about 10 minutes to get them really cold before using. 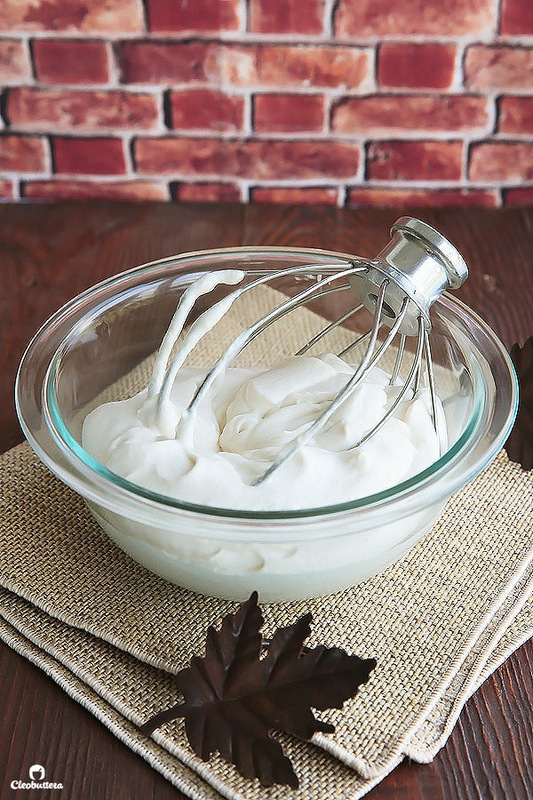 In the chilled bowl, whip the cold heavy whipping cream with the chilled whisk attachment until foamy. Add in the reserved, cooled *(see note below) 1/4 cup plus 2 tablespoons caramel topping. Whip together until the caramel is incorporated and stiff peaks form. Alternatively, if using ready-made whipped topping, simply fold in the caramel topping. I used both Pillsbury and Betty Crocker cake mixes with great results. Make sure you use a (15.25oz) cake mix, as using a different size will alter the results. If a (12.7oz) cake-mix is all you can find as in some countries, then buy 2 boxes, use 1 whole box then add to it (2.5oz, 1/3 cup plus 2 tablespoons) from the other box. Save the remains of the second box for another use. Pumpkin pie spice can be substituted with 2 teaspoons cinnamon, 1/4 teaspoon ginger, 1/4 teaspoon ground cloves, 1/4 teaspoon nutmeg, 1/4 teaspoon all spice. Make sure that the caramel topping is just at room temperature and NOT chilled before adding it to the whipped cream. Cold caramel topping will not dissolve well into the whipped cream and may create bits throughout. Cake recipe adapted from Betty Crocker. Caramel topping recipe adapted from Betty Crocker. Disclaimer: I added a tiny extra caramel in the cake slice’s grooves when photographing to make it more photogenic. If your cake slices don’t have as much caramel oozing out of them when you cut it open, don’t worry; there’s enough caramel hidden inside, that you won’t miss that dramatic ooze. Promise! Hellooo love : ) i was off cooking for the summer but now I’m back to following you again to a tee! regarding the pumpkin puree. what is that? i get a pumpkin, dig the insides out and put in a blender ? Also whats pumpkin spice ? will i find that ready in the supermarket (in Egypt)? Pumpkin puree is sold in cans at the supermarket next to the canned cherry and apple pie filling. Last time I saw it was at Seoudi, but I’m pretty sure you could find it at all the other big supermarkets. Just make sure it says pure pumpkin puree and NOT pie filling. Don’t be alarmed if it doesn’t smell good, it will turn out fabulous once you add in the cake mix and spices and bake it. As for the pumpkin pie spice, you might be able to find it at Petro or in Maadi, but I don’t think you should even bother because it’s simply a blend of readily available spices. You’ll find in the ‘NOTES’ section beneath the recipe what you could use as a substitution. OMG This looks SOOOO good!!! Thank you Leticia so much! Hi Tasbeeeh, I am May your new friend on the sight , i really loved it and i am going to try a lot, isa . I amgoing to start with this one as i want to know” the not very sweet caramel” tastes like, it is a challenge . i need to ask few questions before preparing the ingredients. 1- what kind of mix cake do you prefer ??? 2- can i use the same amount of fresh pumpkin puree instead of the can??? 3- where can i find the pumpkin spice????? 1-My favorite cake mix is Betty Crocker. I used the vanilla for this one, but yellow is perfect too. Just make sure its the right weight 15.25oz. Please refer to the ‘NOTES’ section of the recipe for more details. 3-Pumpkin pie spice could be very hard to find in Cairo, so I’ve added in the ‘NOTES’ section of the recipe how you could made your own. It’s just a blend of spices like cinnamon, ginger, ground cloves, grated nutmeg, etc. Hi. 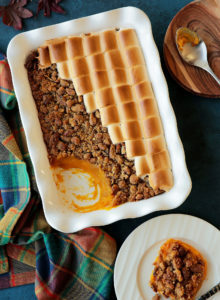 Making this for Thanksgiving tomorrow. If I put it together tonight, will the whipped cream fall or liquefy? Also, will the caramel just soak into the cake? Should I assemble it in the morning or right before serving? Sorry for all the questions!! Happy Thanksgiving Heather! You’re right, the whipped cream could weep if made so far in advance. You could however, make & soak the cake tonight & then prepare the whipped cream tomorrow. The sauces will probably soak into the cake a little more than if you make it the day of, but the taste will remain the same. You’ll just miss some that ooz-ability but will taste delicious regardless.